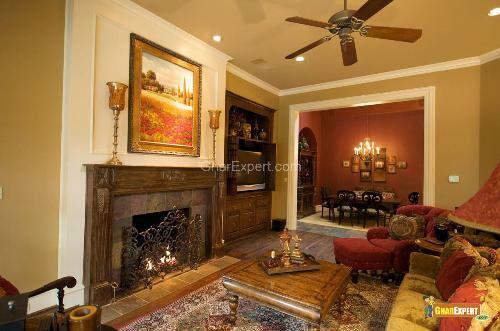 Rustic style interior creates wildlife ambience in your homes. 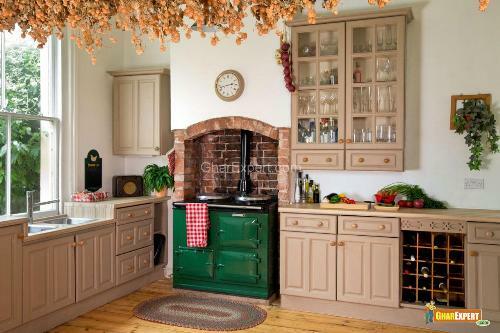 Rustic style is also one of several interior styles available to decorate home such as Ethnic Style Interior, Modern Style Interior, Traditional Style Interior, Contemporary Style Interior etc. This style is country style and everyone must know his/her country style. In Rustic Style all accessories, furnishings, lightings give a feel of wildlife. Rustic life style goes through wild life, accents and cottage logs. 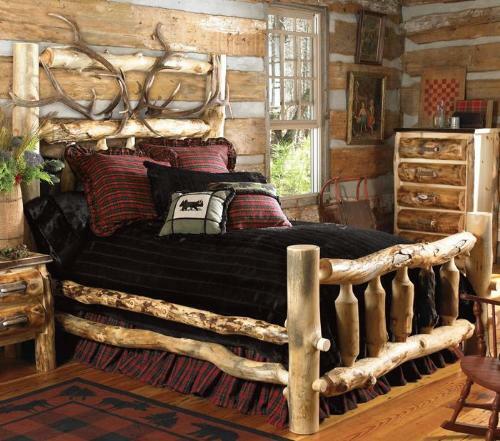 Rustic style bedroom decoration is not only meant for your favorite colors on walls, but it’s always more than that. Antique furniture, old surface, natural wood and a rough look always give a rustic style bedroom. Wooden planks flooring covered by carpet gives a rustic look to bedroom Bedroom Furniture such as bed, dresser, side tables, ‘almirahs’, and chests with aged surfaces offer rustic look. Think naturally when color your rustic style bedroom such as opt for natural colors, white, earth tones forest green, burned red colors etc. Decorative wall scones are used to light up rustic style bedroom. Rustic style living room has a lot of accessories or furniture items that give more relaxation and casual ambiance to the room. Furniture such as sofas, chairs, all has fabrics in white or cream colors, deep red color or in dark green color gives rustic style to your living room. The furnishings consists of heirlooms, antiques, wall accents, wooden logged furniture and knotted furniture with wood in rustic style. You can choose a log sofa to give rustic style in living room. Unfinished and bare wooden beams, floors and ceilings are the essentials of rustic style living room. Rustic style dining room has a big wooden plank table with armchairs; you can opt for a small round table if the space is not enough to place big one. A dining table having a wheeled top with glass and matching chairs in natural dark wood tone gives a rustic style to your dining room or dining area. 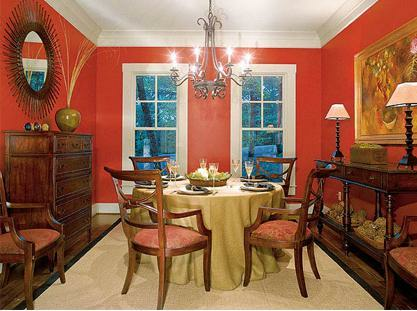 To light up your dining room in rustic style use ceiling lights for dining. 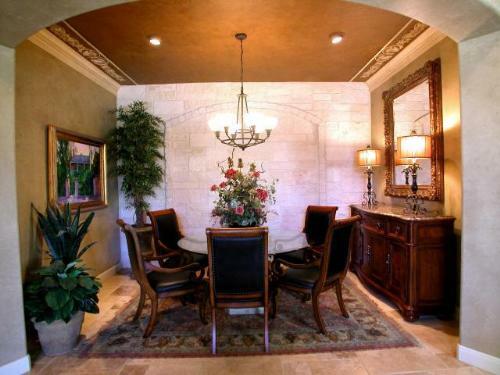 You can also place wall scones for lighting in rustic style dining rooms. 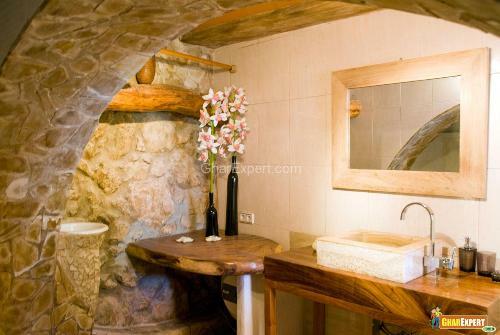 Rustic Style Bathroom includes natural earthy colors, stones and wood, wall claddings, wooden counter tops, marble basins, marble tubs with cladding outsides. Rich and natural color fixtures that look like handcrafted items offer Rustic Style touch to your bathroom. Place a window in bathroom with peeled framed in golden or dark wood color. In case of bathroom cabinets, countertops, flooring with ceramic and granite or in marble choosing hold your eye on the importance of natural’s materials. 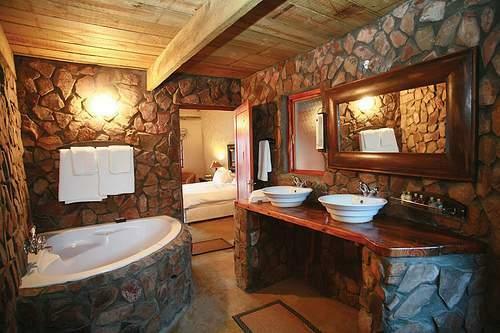 Stone tubs, basins, floors, sinks, walls are the essentials of the rustic style bathroom.